What Are Copper Pinhole Leaks? Home / Plumbing / What Are Copper Pinhole Leaks? 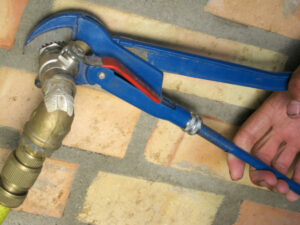 For a long time, materials such as cast iron and galvanized steel were common in pipes and plumbing systems. These days, such materials are looked upon as being rather outdated. Alternatives, such as various polymers and plastics are far preferred. So too are copper pipes. Despite their great reputation, though, you’d be mistaken in believing that copper pipes are problem free, let alone that they’ll last forever. Copper pinhole leaks are a relatively common issue, and can cause a whole lot of trouble for homeowners. Fortunately for you, our exceptional plumbers are never more than a phone call away. If you encounter any plumbing problems, such as these leaks, you can count on us for great plumbing repairs in Bradenton, FL. Copper pipes did not just stumble into the level of use that they enjoy today. They are famed for their long lifespan, for their ease of use/fitting/cutting, and their resistance to corrosion. However, due to changes in water chemistry in certain areas, copper pipes may sometimes suffer from copper pinhole leaks. These are leaks that basically work from the inside of a pipe outwards. Pitting corrosion develops on the interior wall of the pipe, with a pinhole leak being the final outcome. Of course, because the issue develops within the pipe, it can be tough to spot before leaks begin. These leaks may not result in a flooded basement, of course, as they are rather small. They can easily go unnoticed over time, though, and before long they can do serious damage to your home, including walls, floors, ceilings, electrical system, etc. It can also result in mold growth, especially in our climate. Depending upon the chemistry and quality of your water, using a water treatment system may be able to reduce the risk of encountering such problems on your property. Contact us to have your copper pinhole leaks repaired, and to discuss further preventative options.